Recently, I had the pleasure of being able to work with implementing a piece of our UI in a new and fundamentally different way than in previous approaches, and I thought it would be an interesting and informative lesson to share, especially for folks looking to do the same. As I continue here on this blog with a summary, please note that the full content/example with more detailed information can be found here on my personal blog. 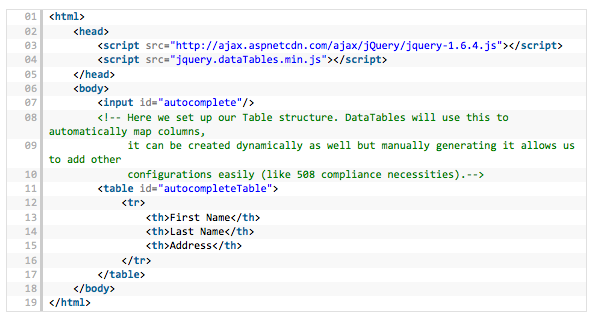 DataTables is a JQuery Table creation / enhancement plugin that started a few years back. We used to use Trirand JQuery Grid plugin but moved away when we found that it was not Section 508 compliant due to how it handles a lot of the "fancier" functionality. DataTables provided a clean entry point and very minor tomfoolery with the necessary HTML to allow for a much nicer 508 result. We were on the fence initially due to a previous requirement that the data used must be an array of arrays, but with the 1.8 release that went away, and you can use JS objects as input instead, making this a very powerful and easy-to-use Table technology. Another primary reason for doing this (which is not shown in the example), is that we wanted the data that is shown to be populated via a back-end search mechanism. So in our circumstances, our filter function is actually posting a request to a server and retrieving a JSON result set. As was pointed out to me regarding the example, this example could easily have also be accomplished by adding all the sample data to the table and using the DataTable filter box. To continue reading/see the full content, please head over to my blog, Caffeinated Coding.